alison’s brother jay suggested a while back that we try out a place called 1kept because he knows the chef there. after a few weeks of snowstorms, we finally were able to make it to south buckhead to give this place a try. before we get to the real reviews, let me tell you, this place might be number one on my list so far. the food was fantastic, the atmosphere was thoughtful, and the service was great. read on to find out all the deets! to put it simply and correctly, “1kept is a collaboration of industry professionals who seek to provide a comfortable and sophisticated dining experience.” i can promise you that this truly is the case. after parking your car in the back lot and climbing the stairs, you are welcomed at the door by the friendly host and shown inside. although not massive, the dining area is spacious and dimly lit and lively. there honestly does not seem to be a bad seat in the house. we were directed to a large high-top right near the bar for our group. we hit another high with 13 people this week, again! folks must be catching on… the weekly event has become such a hit that we even had a special out-of-town guest join us while he was passing through, jon’s brother josh. welcome! i almost hesitate to describe 1kept, because i don’t want to be cliché and i want to do it justice. it is almost a mix between industrial and mountain cabin, but it is not overdone and they do not clash. it has a “speakeasy-style ambience of privacy but business.” it is comfortable and spacious, the perfect spot for our evening. josh especially liked the selection in music, which included songs ranging from grizzly bear to modest mouse to empire of the sun. i can’t say i had any complaints about it either. the focus here at 1kept is creativity and innovation. they want and encourage their chefs to create synergy, piggy-backing off one another to unveil “great ideas and flavorful food” that spread joy and love. if that does not warm you up to the idea of trying this place, i’m not sure what will. what else warmed us up that night? the food and the drinks, for certain. i had water and a 7 and 7 to start, and things only got better from there. if you do not already know, i have a strange obsession with beets. yes, those red, earthy things that come out of the ground. those things that doug funnie could never eat but those things that also coined the name of the band that he loved. (if that reference isn’t ringing with you, your childhood didn’t take place in that wonderful era known as the 90s. i digress.) i ordered the local beets and radish appetizer, despite the turned-up noses of my fellow diners. the pomegranate reduction, walnut oil, and pecorino paired nicely with the beets and radishes. although i normally do not care for arugula, its bitter nature actually complemented the other ingredients quite nicely. even though i knew the answer would be no, i offered a bite of the dish to everyone else. jon actually accepted! i scooped some onto his plate, and as he cut into the beet, there was no hiding his feelings. “kelsey, the texture of this, even with my fork, is awful.” i couldn’t help but laugh! he bravely took the bite, and we anxiously awaited his reaction. as the beet met his tongue, his face instantly scrunched up into the frown of a child who has discovered his new least favorite food. jon was the gentleman, though, and politely finished it like a champ. needless to say, he now knows, without a doubt, that beets are not for him. something jon did like, though, was the bruschetta that he and his brother josh ordered. “the tomatoes were fresh as could be, warm and rich, and the bread tasted like it had been toasted over a fire.” the toast was even described as “off the chain!” jon declared it was “the best bruschetta i’ve ever had.” jon had a couple drinks to go with his appetizer, three if you count the delicious water. he first tried the gin cocktail, which proved to be just a tad too adventurous for him. the malaysian lime gin, basil, soda, and other various herbs were “too earthy” and needed to be watered down. he couldn’t hide his opinion about this drink either. after finishing it, he promptly ordered a 40 creek canadian whiskey and coke, a “good ol’ reliable” that he should have stuck with and doubled down on in the first place. drew v. had raved about the black truffle popcorn with parmesan they make and kindly ordered a few bowls for the table to share. he promptly scarfed down nearly half a bowl, it’s that good to him. i tried a few pieces myself and did enjoy it also. like josh, i usually think truffle oil has “quite a strong flavor” that is sometimes “off-putting,” but on this popcorn, it merely added a new and unusual flavor that was quite nice. if you have that kind of palette, give this stuff a try when you come. while we continued to work through the appetizers, the waitress took our dinner orders. (p.s. the service was fabulous!) i had planned to try the short rib risotto because it sounded divine; however, it turns out they did not have that in the kitchen. well, then, the seared scallops it was! my friends always laugh when i order scallops because it is quite my m.o. i never fix them myself, so i love to enjoy then when i am out to eat. my dish arrived warm, and i had to keep myself from drooling upon its arrival. the four scallops were of good size and nicely browned on each side. and the corn risotto? oh my, i could hardly wait to taste a spoonful. once everyone’s dinner arrived, we dug in, and things were much quieter. my scallops were cooked nearly perfectly; i loved the meaty texture of them. now, the risotto? it was everything a twentysomething girl could have hoped it to be. the corn wasn’t as much of an ingredient as i expected, but i thought it was quite delicious in the risotto. it wasn’t too rich, which some risottos tend to be. without it in front of me, though, the exact flavor is hard to define, but this is a meal i would suggest to someone else and certainly order again myself. i dare to even say that i liked it better than my scallops over at king + duke. i might even say i loved it. oh no, she didn’t! many other folks ordered flatbreads for dinner, which looked quite tasty. josh’s first reaction to his was that it looked a little small, but after the bruschetta and popcorn, it “was just enough to fill him up.” that’ll work! his was topped with calamari, goat cheese, arugula, “and some other stuff he didn’t pay attention to.” we’re guessing there might have also been artichokes. despite the fact that it seemed like a strange combination of ingredients and flavors, he still enjoyed it. however, josh did try and like jon’s sgt. pepper’s flatbread more. although jon doesn’t usually care for flatbreads or thin-crust pizza, “1kept has thin-and-crispy down to a science. the spicy red pepper tomato sauce and crumbled sausage mixed perfectly. the crust was crispy enough to provide a satisfying crunch without making me feel like i was eating a big tostitos chip.” well done, 1kept! another popular dish that evening was the chicken schnitzel and spaetzle. jamie thought it was very tasty with its caramelized onion cream, braised red cabbage, and brussel sprouts. however, she did like the brussel sprouts from the smoke ring much better. vinh thought it was “amazing” and did not leave a bite on his plate, and let me tell you, it was a lot of food. 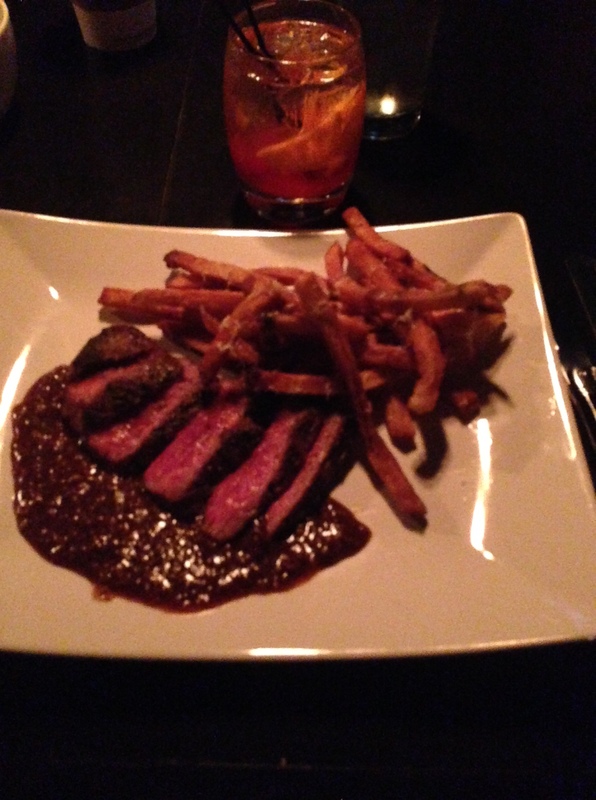 drew v. and philip both had the waygu flat iron with red wine garlic sauce, accompanied by house made frites (pictured below!) philip loved the fries, and they both were in heaven with the steak. it might be a dish i try the next time i go. 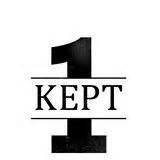 1kept is a place i know i will be coming back to, even if just for a drink and an appetizer. but let’s be honest, i’m sure i’ll end up staying for the entire meal anyway. hey, to give you an actual idea of how much we liked this place, drew v. has been back three times since we went last week; it has become his watering hole. and drew v.? he’s quite the lucky duck; he lives within walking distance! jealous… vinh also cannot wait to find an excuse to come again, to bring friends, to spend the effort and money to eat that schnitzel and spaetzle one more time!